The past year and a half since Connor was diagnosed with Autoimmune Encephalitis has been a whirlwind! This is an update to Connor’s Smile and Prayer Update for Connor. In spite of the severe difficulties and hardship Connor faces, he is filled with love and joy, and has the sweetest spirit. He makes people laugh and brings happiness to all who meet him! We started IVIG, and completed 6 months of treatment. Soon after we began the IVIG treatment we immediately began seeing changes in Connor. His language skills began to improve, and he was able to attend to tasks longer. As many of you know, our insurance company refused to pay for this very expensive, life changing treatment for our son. We have stopped Connor’s IVIG treatment stopped for a couple of months to let the medicine completely leave his system, before we could re-test. We are looking for a supplemental insurance policy to cover the astronomical costs associated with treatment. We haven’t taken that test yet, because the test cost is $1,000, and if the antibody is still present, that would require additional costly IVIG treatments. This is Connor receiving one of his weekly IVIG treatments. In addition to IVIG, Connor’s year consisted of Speech therapy, Occupational therapy, Physical therapy, Vision therapy and Educational therapy, several days a week. We are making good progress. Slow progress, but good progress. As Connor’s brain heals, we have to go back and fill in all the developmental gaps. In many ways Connor is a typical teenager. He loves video games, music, and movies. He great receptive language, that means he understands us talking to him, but still has a difficult time with his expressive language. However, he is learning to speak more now then ever before. In the last year, Connor has learned to catch and throw a ball, and ride his bike. His speech and vocabulary has dramatically improved, and for the first time in his life, people can understand him speak! His coordination is improving, and he is evening learning to write, and spell his name. On November 3rd Connor turns 18. For Connor’s birthday, we started a go fund me page to raise money for his all his therapy and medical treatment. Please help us spread the word to help our little man get the life changing treatment he needs. If our campaign reaches $500 dollars, then it will get national exposure. Please join us in continued prayer for Connor’s healing! God is doing amazing things in Connor’s life, and we look forward in anticipation to lies ahead. Today on the blog, I am talking about the importance of the family table, and sharing a few pictures from our Thanksgiving table 2013. Earlier this week, we heard from Michelle S Laurek on practical ways to love our neighbors, and I told you about her new book, An Invitation To The Table: Embracing the Gift of Hospitality. If you missed that post, be sure to check it out here Love Your Neighbor! I love this description of An Invitation To The Table: Embracing the Gift of Hospitality from Amazon. Jesus spent a chunk of his ministry eating and drinking with the “”sinners and tax collectors”” of the world. If we strive to be more like Jesus, shouldn’t we do more of what he did? Hospitality involves more than the domesticated event we have grown accustomed to practicing. It is an embodiment of all the Christian life stands for: a gesture of love, opening up our hearts and lives, and sacrificing luxury and security for the chance to display Gods glory. To receive hospitality from others is an invitation to receive Gods transformative power to work in their lives. Wow! Have you ever considered your family table a place of ministry? We have a huge farm table that we purchased several years ago to accommodate our growing family. The wooden sun-bleached benches on either side of our 10 foot table are flanked by several mix-and-match black chairs with rush seats. It is reminiscent of farmhouse meets french flair, and it is located in our beautiful sunroom. The sunroom is one of my favorite rooms in our house because it has 12 huge windows that look out into our back yard, and we have a gorgeous view of the sun rise. The importance of the family table, and the top 3 reasons I love mine! And you should love yours too! Fist, there is something special about choosing the perfect table linen, arranging your favorite dishes, and adding a seasonal centerpiece. I love to prepare a feast for friends and family. I am going to let you in on a little secret though, I have a dish problem. I love my dishes and love any excuse to use all of the dishes that I have collected over the years. 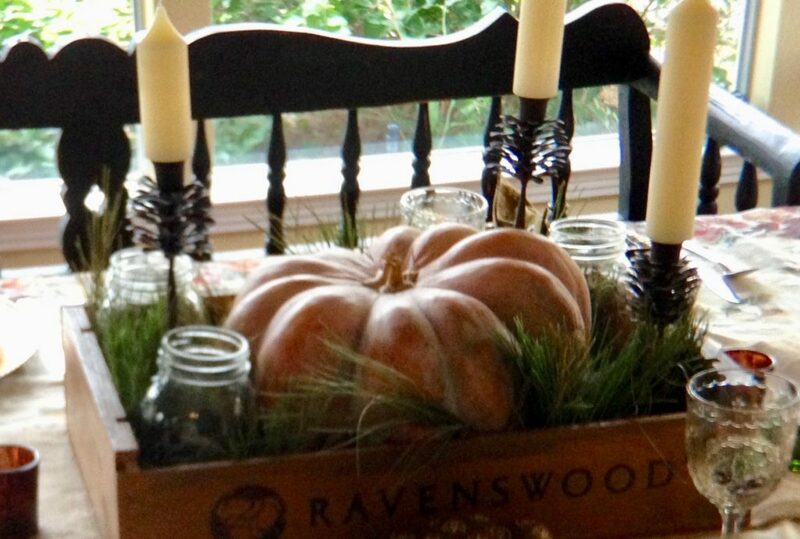 The table is another great place in our home to spruce up with the changing of the seasons. I love to search Pinterest for new and creative ideas for my tablescapes. I also love repurposing old things and using them in new or unexpected ways. For the 2013 Thanksgiving table, I used an old wine box, that Peter brought home twenty years ago when he worked at a hotel. I darkened the box up with a little leftover stain that I had from another project. Nestled in the box is a fairytale pumpkin, some pine bundles from our trees, Mason jars with tea lights, surrounded by pinecone candle holders with cream tapers. Depending on the formality of the holiday or occasion, I may use chargers or place cards. When my children were young, and I wanted to make our holiday tables special, I would include them in helping me make place cards. For the 2013 Thanksgiving table, I purchased these vintage goblets at an antique store for just a few dollars. This was a fun way to serve our beverages, and I didn’t have to worry about them breaking. Second, conversations at the family table tie heartstrings to our children, family members, and friends. This is an important time of connection and communion. At the table, you can linger, talk about your day, and impart your values to your children. There is time to reflect on issues that arise in our culture, morality, religion, politics, and books. Gathered around the table is also a great place to share stories from the past, or tales of family members that have gone on to be with the Lord. This is something that Peter’s mom Gigi instilled in me early in our marriage. We spent many hours in lively conversation as a family around the table. 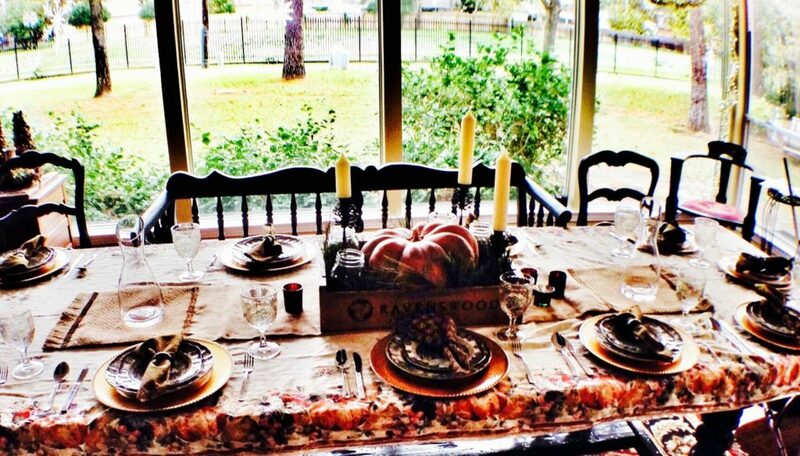 The Thanksgiving 2013 table pictured is very special to me because this was the last meal we shared together as a family with Gigi. She was an amazing woman, who was an incredible influence on my life. Read more about this at 5 Things Gigi Taught Me. Holiday tip when entertaining for the holidays and small children are sharing the table with us, I always put a fancy tablecloth on the table, but then cover it with clear plastic. This way the table still looks beautiful, but it is protected from the inevitable spills that are bound to happen. Third, in this fast-paced microwave society that we live in when families are going in different directions all the time, and we eat at the drive through or on the run. To have time to sit down and eat a home-cooked meal on real plates, not paper ones, and have time to connect at the table, and enjoy a meal is priceless! Whether you are gathered at the table for a holiday or sharing coffee with a neighbor or friend, know that your table can be a place of ministry. “So, whether you eat or drink, or whatever you do, do all to the glory of God.” – 1 Corinthians 10:31. I hope you enjoyed my latest posts on preparing your home for the holidays. Stayed tuned, because there is more where that came from. I love this time of year, and I am excited that I get to share it with you! If you missed them, you can check them out here Holiday Preparation and Inspiration! and here Our Home – A Sanctuary. Today, I am excited to share some wisdom from my friend, author Michelle S. Lazurek and tell you about her beautiful new book on hospitality. She is going to share Jesus’ command to love your neighbors. I am blessed with the best neighbors! When it comes to neighbors, we won the lottery, and they make it easy to love them. But in the crazy busy world we live in, how can we follow Jesus’ command to truly love our neighbors? Michelle gives us a couple of great ideas. But in this overextended, overstressed, independent world, how do we initiate relationships with our neighbors? Write a note– In this day and age, people are more suspicious than ever about what might be lurking inside a welcome basket. Gone are the days when a neighbor could give a basket brimming with luscious fruits or candies without resisting the urge to split each goodie in half to look for mysterious materials. Sometimes a quick note and gift card can suffice. A simple note stating you are happy to have them in the neighborhood and giving them a night off can speak volumes in your love for them. This may pave the way for a neighbor to knock on your door to express their gratitude—and for you to open the door to a new relationship. Start a Facebook group– Conduct a simple search on Facebook to see if our neighbors utilize the social media site. Create a group of neighbors and discuss topics on how to improve your neighborhood, put out the feelers for interest in get- togethers and discuss pop culture topics as a way to get to know your neighbors’ likes and dislikes. This gives you something to talk about when you bump into your neighbors on your nightly walk or an opportunity to roll down your window when you see them going to their car. Every conversation matters and brings you one step closer to a new friendship. Crafters Unite– I’m not terribly crafty, but even I love an excuse to get out my adult coloring books and crayons and relax. Do any of your neighbors paint, draw, read or scrapbook? Ask to meet to create together, rather than separately. If you don’t participate in these hobbies, is there one you have always wanted to explore? Meeting a neighbor is the best reason ever to learn a new skill or indulge your crafting side on a regular basis. We are all called to love our neighbors as ourselves. Now you have a reason to merge beloved skills with a desire to fulfill Jesus’ greatest commandment. Michelle is the author of An Invitation to the Table – Embracing the Gift of Hospitality. Jesus spent a chunk of his ministry eating and drinking with the “”sinners and tax collectors”” of the world. If we strive to be more like Jesus, shouldnt we do more of what he did? Is it something I am, or something I do? How do I offer my life as a gesture of hospitality? What are some practical ways for me to display and receive hospitality? An Invitation To The Table: Embracing the Gift of Hospitality is available on Amazon now! Do you have other ideas about how we can love our neighbors? How do you plan to open your home for hospitality this season. I would love to hear from you! We have a Winner & an Announcement! Congratulations Kimberly Vogel! You are the lucky winner of Jennifer Rothschild’s beautiful new book, 66 Ways God Loves You-Experience God’s Love for You in Every Book of the Bible. I pray that through the pages of this book, that you will know just how much God loves you! I want to say thank you to everyone who commented on the post God Loves You! If you haven’t seen the 66 Ways God Loves You video, then check it out see how God loves you in every book of the Bible! Your feedback means the world to me! So stay tuned because I am excited to announce that I will be reviewing two new books, and have some great giveaways before the holidays. First, I will be giving away an amazing KJV Journal the Word Bible sturdy hardcover Bible from (Thomas Nelson, September 2016). Then in November, I will be giving away New York Times’ Bestselling author Karen Ehman’s new book, Bible study, and DVD! Listen, Love, Repeat: Other-Centered Living in a Self-Centered World (Zondervan, November 15, 2016) is Karen Ehman’s ninth book and has a Bible study with DVD with it. Karen is an encourager to women, and her life work is to help women live their priorities and to love their lives. Karen is a Proverbs 31 Ministries Speaker and New York Times bestselling author. She is also the Speaker Track Director of the She Speaks Conference and a teaching staff member of Proverb 31’s writer’s training program COMPEL. Celebrating the holidays with friends and family is a great way to make memories and tie heartstrings with those we love. Last week I talked about our homes being a sanctuary, Our Home – A Sanctuary. This week, I am excited to share a few more photos of my 2016 fall decor in my home, along with a couple of photos from Christmas 2015 to inspire your upcoming holiday decorating! Also, I want to tell you about a lovely book that will inspire you with your holiday planning. This wonderful little e-book was written by my friend Debi Chapman, and it will help prepare you for the holiday of your dreams! In the coming weeks, I plan to share other books I love on hospitality, and making Christmas meaningful. I just love this new vignette on my entry table – a beautiful floral arrangement surrounded by mercury glass canisters and candles. At the front and center of this photo is a beautiful cross that I recently purchased. The cross is such a beautiful reminder of Christ’s sacrifice for us on Calvary. God loves us so much that He sent His one and only son, Jesus Christ, to come to earth to live and to die, just to save us! If you are interested in learning more about God’s great love for us, I would love to share the good news of Jesus Christ with you! Pictured below is that same entry table in Christmas 2015. 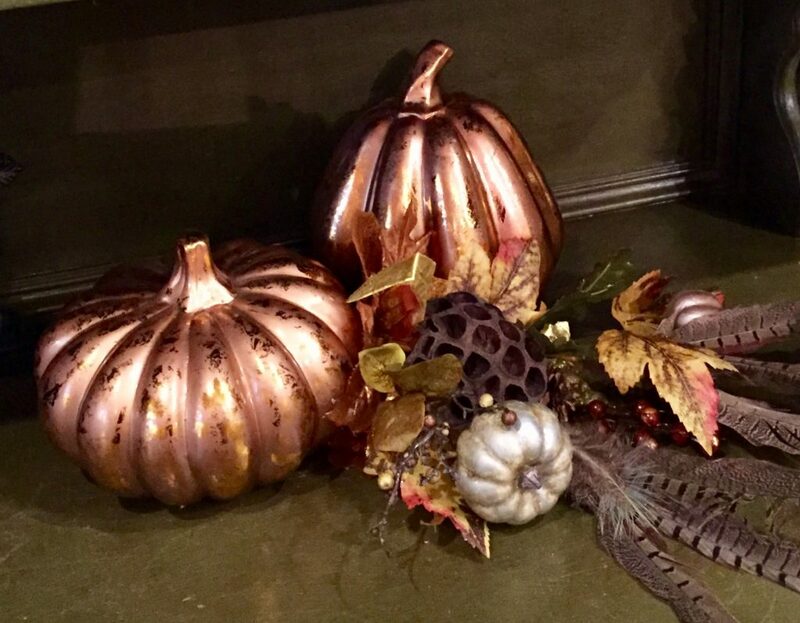 I love to incorporate my existing decor with seasonal items. Here I incorporated my mercury glass containers and paired them with a beautiful cherished nativity scene we received as a wedding gift from a family member, a nostalgic looking Santa Claus, and a beautiful sleigh filled with gold ornaments, flanked by lit aspen trees. One of the reasons that I love Christmas so much is because it is a celebration of the birth of Christ! We have so much to celebrate! During the Christmas season you will find nativity scenes scattered all throughout my home, because Jesus is the Reason for the Season! Another area that is easy to change with the seasons is my fireplace mantel. It is the focal point of the great room in my home. My decorator friend, Sherry from Just Lovely Decor, always helps me to come up with beautiful vignettes and holiday decorations. I love the way these white pumpkins look with the heathered blue pumpkins and florals. If you live in the Houston area and would like help decorating this holiday season, Just Lovely offers full design and installation of decorations for your home. Just let me know, and I will put you in touch with my friend Sherry. Pictured below is my mantel all decorated for Christmas 2015, along with a side view of my Christmas tree. Notice how I have used the same candle holders and mirror both in fall and at Christmas. Again using my existing decor and adding some seasonal items to spruce things up. By taking advantage of sales each year, I add a few pieces to my Christmas collection every year. My collection began to grow when my mom started a very special Christmas tradition with my boys. From the time they were born, they would each receive an ornament from her as part of their Christmas present every year. I love this tradition, and plan to do the same thing for my grandchildren in the future. Another special tradition that began early in my marriage was Gigi would take us shopping after Thanksgiving dinner every year. These are special memories I hold in my heart. What holiday traditions are you celebrating this year? Are you overwhelmed by the thought of preparing for the holidays, or are you just not sure where to start? I am excited to tell you about my friend Debi Chapman, and her new e-book Holiday Happening – 21 days to the holiday of your dreams. In Holiday Happenings, Debi gives you practical ideas and tips to make the most of your holiday season. This book is filled with beautiful pictures that are sure to inspire, along with practical how-to advice to prepare your home for the holidays. I love the way that Debi incorporates healthy living and use of essential oils for your home during the holiday season. She encourages you to dream, and then provides practical hints and tips to pull it all together. I can’t wait to incorporate Debi’s wisdom in to my holiday planning this year! In Holiday Happening you’ll find a simple path to 21 days of purposeful holiday preparation. Follow the plan day-by-day and I know you’ll begin to see your ideas take shape. Each day will take you one step closer to the holiday of your dreams. The ebook comes with a Holiday Happening Pinterest Board and a Facebook Page to gather and share ideas, progress reports. You can order a copy of this e-book at: www.holidayhappening.com. Books are only $5 and are payable via Paypal. Debi’s mom-journey began over 30 years ago. Armed with a newfound devotion to Christ and a Child Development background, she married her college sweetheart. Together they began to dream of what a family could become. Presently, Tim and Debi have eleven children, nine grandchildren, and lives filled with frontline battle scars and victories beyond measure. Debi desires to leave footprints for those who follow and impart grace to mothers of all ages. I hope you found some inspiration to help you begin preparing for the upcoming holiday season and look forward to more helpful holiday inspiration in the coming weeks. I would love to hear about how you plan to celebrate your holidays this year!